They say that a man’s home is his castle and this can be equally true for kiddos just as much as adults. At some point during your little one’s childhood, they will most likely go through a phase where stories about knights and dragons, kings and queens, princes and princesses, rule their play time. After all, who wouldn’t want to be a ruler of their own little kingdom? Despite their generally pink and feminine appearance, castle toys are easily suitable for all genders. After all, who’s to say that a knight has to be a boy or that a dragon can’t be a girl? This makes these toys ideal for children of all ages and backgrounds. What little one doesn't love the idea of ruling their own castle? With our new guide format, your family will be able to compare all the best products based on important criteria and numerical ranking. This page was recently updated to reflect the best castle toys for kids in 2018 which are perfect for developing fine-motor skills and imagination. With our new update, we removed all products that were no longer available and replaced them with the best and the highest-rated on the market today. 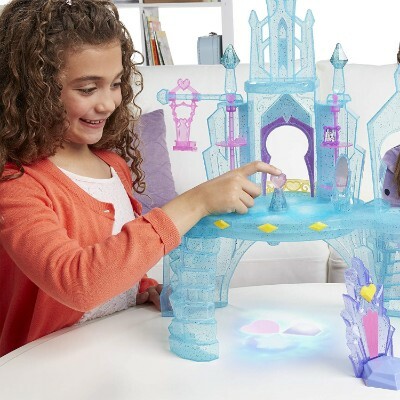 This castle will let your little one feel like a real princess and let her interact with her favorite Disney Princesses in an almost conversational way! This castle is the perfect play set to encourage pretend play. Your little one will be able to emulate their favorite Disney Princesses and even scenes from their favorite movies throughout the different rooms of this castle. The interactive features such as the spinning dance floor and movable balcony are all kid-powered, strengthening their grip and improving fine motor skills. Spatial relationships like on, up, down, open, and close are also presented through age-appropriate play. Little People is a well-known brand who are renowned for making toddler appropriate toys. 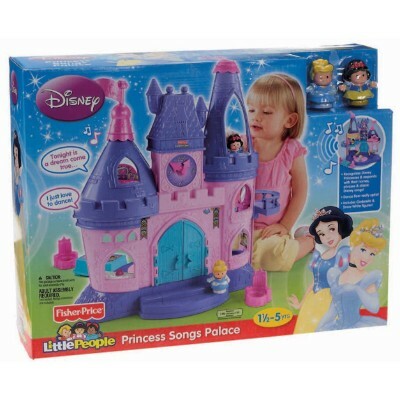 The Fisher-Price Little People Disney Princess Songs Palace is no exception. This adorable castle features seven different rooms, each with a unique interactive function. From the whistling tea kettle in the kitchen to the balcony-like elevator that takes her figures on a ride up to the tallest tower, your little princess while being able to play princess for hours at a time. Cinderella and Snow White are ready for the ball and placing them on the magical dance floor allow them to twirl and dance while a delightful waltz tune plays. Even more exciting is the center pedestal on the dance floor which recognizes not only the princesses included with the castle but all Little People Disney Princess figures! Place each figure on the pedestal to hear them speak their name, a unique phrase, and even sing a song! 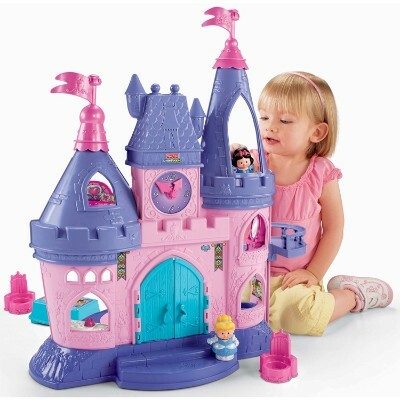 This castle puts your little princess right into her favorite Disney stories! This perfect playset is an ideal gift for the littlest princess in your life. This playset features bright, enticing colors that will draw your little one’s eye, helping to improve their visual tracking skills and acuity. The included toys provide several different auditory and sensory stimulations, from crinkly fabric to squeaking and neighing noises. Providing your infant with mentally stimulating toys from a young age can help develop cognitive growth. The castle closes with heavy-duty velcro that cannot be felt from the outside so there are no rough corners that could damage your baby’s fragile skin. All of the included toys fit inside the castle which is surface washable to prevent staining from the inevitable spill or spit up. All of the details are embroidered as well making this toy completely safe for infants. While most castle toys are designed for children of at least toddler age, the Princess Castle Stuff Plush Playset by Baby GUND is the perfect gift for your newborn. 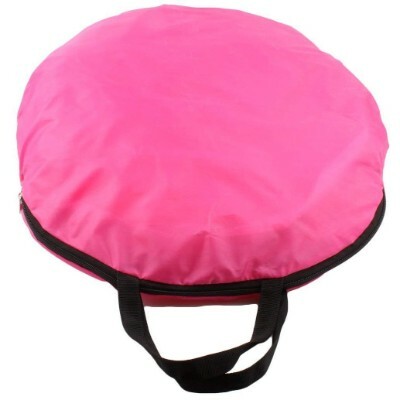 This soft castle toy opens via a velcro hinge on the top to reveal five stimulating princess-themed toys inside. From the crinkly princess doll to the squeaking wand and even a little unicorn that neighs when squeezed, this playset is the ultimate doctor’s office or restaurant toy. 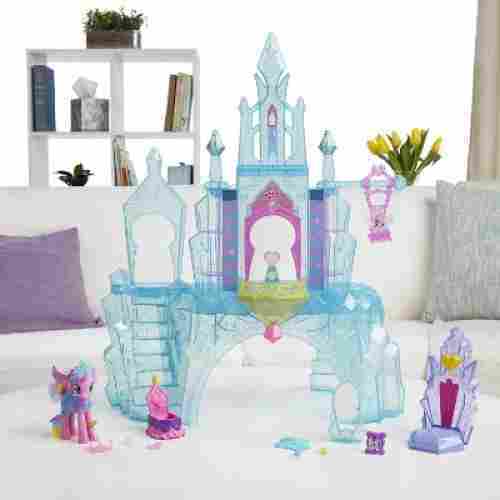 Looking just like a real crystal ice palace, this My Little Pony castle will provide loads of fun for your child. It is constructed in a beautiful, blue-ice color material that is see-through. 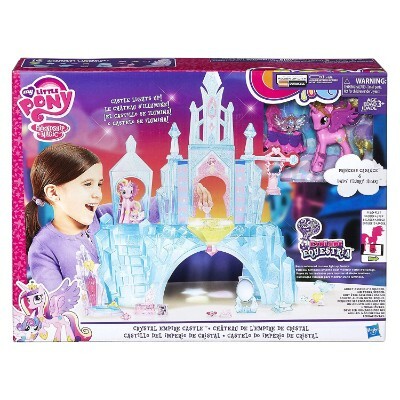 Figures of Princess Cadance and Baby Flurry Heart come with this glorious castle for your kids to enjoy. The castle has several play areas for kids to explore from all sides, such as a baby swing, two staircases, and two closets with revolving shelves. An App for more playtime fun comes with the toy so kids can enhance their wonderful castle adventures. Assembly is required, but easy-to-follow instructions are provided. Children can act out exciting royal scenes with the many accessories for the characters, including a throne, cradle, mirror, comb, crystal vanity, jewelry, tiaras, and dress. The light-up castle exposes three cutie spots whenever the heart-shaped knob is pressed. Children can play out many royal scenes with this lovely castle. The included figures give kids a couple of characters to play with, but other My Little Pony figures are compatible with this toy for added enjoyment. 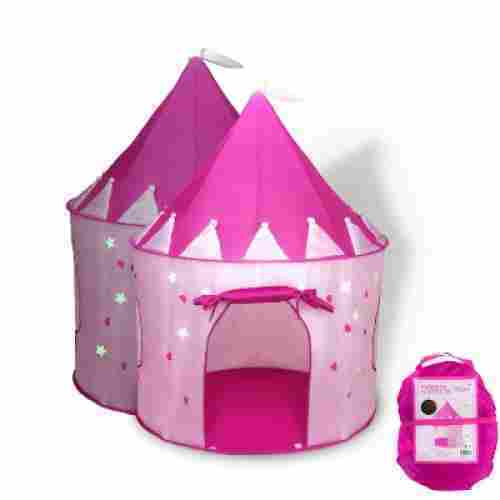 From tea parties to royal engagements, this Princess Castle Play Tent from Fox Print is the perfect play tent for your little princess. 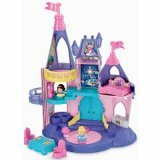 This is the perfect way to give your little princess her very own castle hideaway! This play tent can provide your daughter with a safe, private space that is all hers. This is important during formative toddler to school-age years as your little one’s independence and desire for privacy grow. 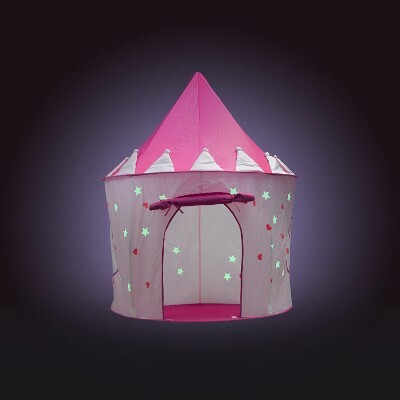 Featuring a pop-up style construction, this play tent easily converts from a fold-flat carrying case no more than 17” wide to a huge 54-inch tall by 41.5-inch wide castle turret. A roll-down curtain can cover the entrance giving your little one privacy without entrapment. The ceiling and walls of this castle are decorated with stars that glow in the dark! The tent is held up by sturdy fiberglass rods that slip inside sleeves, keeping them hidden and inaccessible during play. When playtime is over simply remove the rods and the whole castle collapses back down to be easily stored inside the provided carrying bag. The bright coloring and whimsical design also provide an excellent catalyst to encourage creativity and bolster imagination. Learning how to assemble and disassemble this tent can also encourage the development of fine and gross motor skills along with self-help skills. Manhattan Toy is a high-quality toy maker that has become well-known over the last few years as a manufacturer of award-winning educational toys. This Toddler Activity Center is no exception. Dozens of activities await your child with this castle-themed play center that is designed to stand on top of a table for larger children or stand freely on the floor for younger children. Each of its four sections is equipped with a variety of gliders, gears, bead mazes, dials, and even a snapping crocodile to encourage the development of your child’s fine-motor skills. Imagination and pretend play are also promoted utilizing the sliding knight and dragon figures. Logical thinking and object permanence are demonstrated within several of this play center’s activities and the bright colors can also encourage visual acuity. Crafted from top-quality and lightweight materials, everything about this treetop castle has been designed to provide safe and explorative play for your little one. Bright and attractive colors will draw your child’s eyes, enticing them into hours of creative play while also providing a beautiful talking piece for your home. All of the detailed touches from the beaded mazes to the delightful wooden figures have been treated with nontoxic paints and finishes to give you peace of mind to know that your toddler is protected from harm while they play. This little castle is the perfect size for tabletop play and provides dozens of interactive activities designed to entice a wide variety of ages and skill levels. Four separate play sections bring their favorite fantasy stories to life with a plethora of interactive play options from mazes to moving figures, to opening and closing doors and windows. Your little one can be the king or queen of their very own fantasy land with this play center! There is no need to assemble this toy because it is already put together when it comes out of the box. Kids just need to open the castle and begin playing for maximum castle excitement. 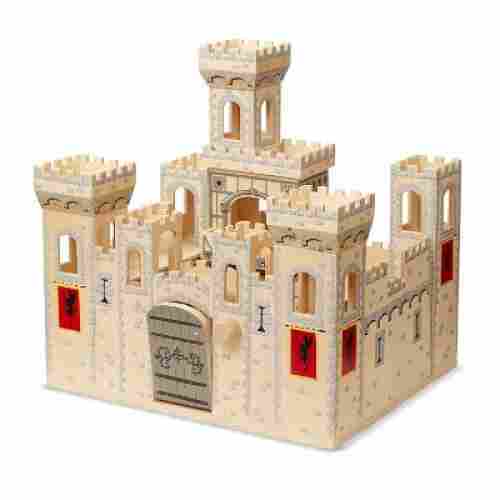 The best ages for this toy wooden castle are two to seven, but kids of all ages that are into castles, especially collectors, will be enchanted with this one. It is a condensed folding castle with a built-in carrying handle that opens fully for unlimited play. There is a queen and king, and they have a royal bed and thrones for each. The knights each have horses and a magical treasure chest. A working drawbridge and a scary dungeon make this castle have all sorts of possibilities for storytelling and imagination joy. The crafted details make this a one-of-a-kind castle because it is quite realistic. Games can be invented to induce play, such as hiding the treasure chest and getting the child to use the knights to find it, practice naming the colors of the characters costumes, or train on number skills by counting steps, rooms, or windows of the castle. 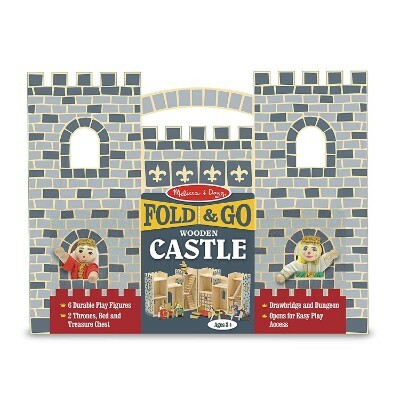 The possibilities are endless with this great product from Melissa & Doug. The fantastic details and sturdy wooden construction of this castle are impeccable! Make-believe fun will most certainly benefit from these exquisite features. Travel toys for toddlers are needed all the time for car trips and waiting areas, such as doctor’s offices and restaurants to keep kids busy and quiet. This plush castle and unicorns is a great item just for that. Toddlers can practice their color identification and names, plus their motor skills in putting the unicorns in the castle windows with this super, soft toy. Simple as it may seem, it gives them great practice with these skills, plus finger sensation and dexterity. Five colorful unicorns call this plush pink-and-white castle their home. They are bean-filled to give them a bit of weight, and they fit perfectly inside the five windows of the castle. The palace makes a grand carrying case for the mystical animals that your toddler can carry around with ease. Children will have much fun in putting them in the castle and then taking them out to engage in fun, fantasy play. All of the pieces are cuddly, soft, and washable. This makes a fabulous travel toy to keep kids occupied during boring times. Imagination skills for toddlers can start with simple toys like this one, so they can build on this ability as they grow. The recommended age is from three years and older, but younger kids will love to snuggle and nap with these dreamlike characters. Practice with colors and counting is encouraged with the five multi-colored unicorns and their castle house. In addition, you can never have too many plush toys like this one for your baby to hold and snuggle. Children aged three to eight will appreciate this toy the best because it is a colorful, impressive castle. The main object is to defend the castle against the evil knights in the many ways possible with the features. Close the lion’s jaws and mane to block the castle entrance or use the lion’s claw to grab attackers. The disks can be turned to defend the castle, trap the enemy soldiers, and let the hidden lion out. Use the crossbow to shoot at the castle in defense or fire disks towards the shield to make the gate open up. Great toys offer kids lots to do, and this one surely does that. Plenty of actions are possible to defend the castle and launch a fantastic attack against intruders. 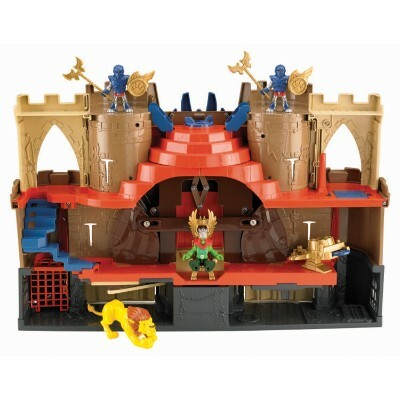 Hours of enjoyment will be had by children that are lucky enough to get this toy Lion’s Den Castle. 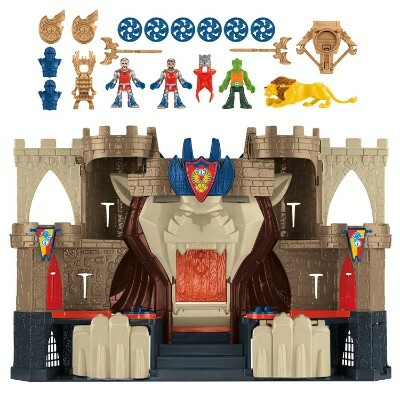 The castle includes two guards, two helmets, lion figure, dragon knight figure, throne, axes and shields, king’s crown, and a crossbow with six shooting disks. Play areas incorporated in the castle are a jail, trap doors, and a collapsible tower. If all that is not enough, the eyes of the lion light up and the castle emits roaring sounds to top off the excitement this fun castle can bring to your child. With four play levels and loads of activities, kids will gain great skills in imagination abilities, storytelling, role-playing, dexterity, and hand-eye coordination. Great fun can be highly beneficial too! 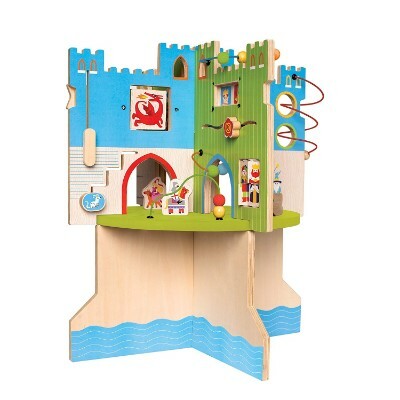 Melissa & Doug do not disappoint with this wooden castle item! Their high-quality workmanship shows with the gorgeous hand-painted details and intricate parts of this fabulous toy castle. Exploration is the fun part of having toys like this great castle. Kids will be encouraged to tell stories and imagine scenes to act out, while they exercise their fine motor skills. They can open and close the working drawbridge and wooden trap door for an operable castle. The turret is removable for varied play, plus the castle folds up compactly for wonderful storage and travel. When this toy is closed, it is a fine castle. When it is opened using the hinged parts, it has a beautiful courtyard in the middle. Kids can investigate the many fine parts, such as the towers, arched walkway, balconies, and dungeon. It serves 2 purposes – one as a cake topper and another as a toy. Frankly, your kid will surely love playing with it right after a themed party. For a homemade cake or one that could not be decorated with the Disney characters you want, this castle cake topper makes any cake your dream come true! The product is created from food-safe plastic, so there is no need to worry about harmful materials. The castle has Belle and the Beast from the Beauty and the Beast in the center top and two turrets that are fully operational as a storage place. They spin and open to reveal a spot to safely keep the small loose figures. This is a very nice feature considering the size of the item. For those that want a cake to have a Disney theme with the princesses of Cinderella, Rapunzel, and Ariel, this is a wonderful product to get. It will make any cake perfectly suited for that Disney princess fan in your family, plus it can be saved as a toy or keepsake if the child collects Disney memorabilia. With delicate details on the figures and cake design, it will be the talk of the party. The main function of this item is as a cake topper for a themed party. Afterwards, it can be used as a toy for kids three and older. As mentioned previously, we focused on three areas of development when selecting castle toys for this list: intellectual development, social development, and psychomotor development. Intellectual development includes things like problem-solving skills, complex thinking skills, and reasoning skills. We feel that many of the buildable castle toys on this list aid in at least one, if not all, these skills to some degree. Social development deals mainly with interpersonal relations among children and helps children relate to the world in some fashion. Many of the role-playing toys on this list aid in a child’s overall social development, but any of these toys can be played by multiple children for a collaborative, social playdate. Finally, psychomotor development deals with a child’s thought process of moving objects. A child’s understanding of their movements in relation to the world is constantly changing and evolving, and buildable castle toys are a great way to increase that understanding. All the buildable castle toys on this list, and some of the pre-built ones, greatly aid in a child’s overall psychomotor skills. Coming up with a list of the best castle toys is very challenging. First, we have to carefully study each toy for their age- and developmental- appropriateness. Toys must be able to help children develop their psychomotor, cognitive, social, and emotional skills expected of their age. Secondly, we must look at the safety of the materials used as well as the quality of the design. Thirdly, we have to consider what countless parents and other consumers have to say about these castle toys. And lastly, we also have to check the toy maker’s overall reputation. We know that these are also the things that you will look for in the best castle toys for your kids which is why we have made them the bases of our selection process. It may have taken us quite a while to come up with this list but, we are hopeful you will find a castle toy on our list that will interest you and your kid. The imaginative aspect of our criteria is pretty straightforward with regard to castle toys. Mainly, we looked at castle toys that offered some form of story creation or role-playing to exercise the creative portions of a child’s brain. Castle toys based on TV shows or popular movies, such as Frozen or Ninjago, give children a familiar base to begin their creative adventures. This base gives them not only great starting material for their own imagination but acts as a catalyst for their own ideas and stories. Though many of the pre-built castle toys offer great creativity liberty with story creation, the buildable castle toys offer an organic kind of creativity. Rather than basing their adventures off an already defined world, your child can create their own by building that world themselves. 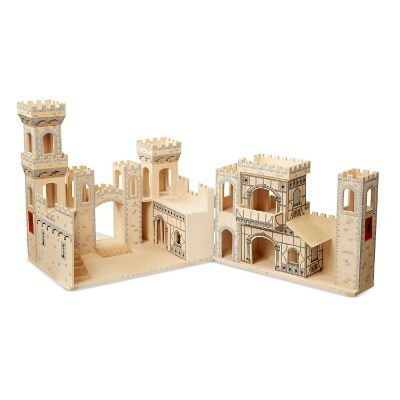 Both kinds of castle toys, pre-built and buildable, offer to create creative outlets for any child. 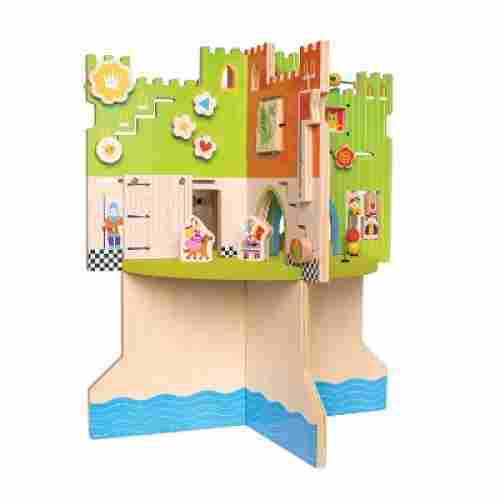 Castle toys are like playhouses that are designed to stimulate imaginative play. Children who are constantly exposed to imaginative play tend to be more proficient at solving divergent problems. They learn to use their cognitive skills to decide which solution will work best for a given situation. This lays the foundation for more complex critical thinking processes. Additionally, castle toys are also excellent tools for developing counterfactual reasoning, also known as the what-if mentality. This allows kids to explore the infinite possibilities of any given scenario which can be beneficial in developing more complex critical-thinking and problem-solving skills. When shared with other kids, castle toys can be excellent instruments for developing language and communication skills. Kids learn to express their ideas in relation to how the different characters in the castle play need to be role-played. This also encourages cooperative play. Enhanced communication can help them develop healthier self-concept, enhanced self-esteem, and boost their self-confidence. 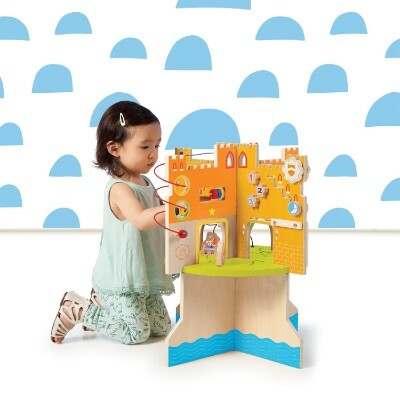 On their psychomotor development, castle toys can help enhance dexterity and fine-motor skills as kids will attempt to build the castle and put on different components or elements into their rightful place. This also helps reinforce mastery of hand-eye coordination as well as spatial intelligence. As always, safety is our #1 concern when creating our top lists. When judging these castle toys for safety features, we first looked at the recommended age of the toy’s user. We wanted a wide range of recommended ages so that all children could benefit from this list and so that none would feel excluded. 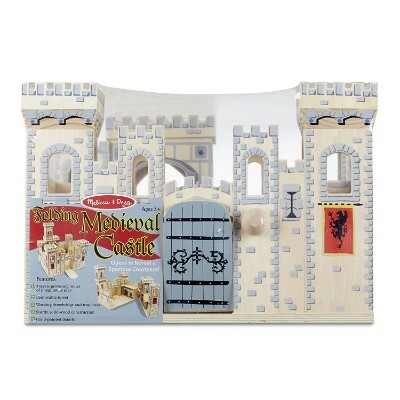 Generally, castle toys that feature small parts are recommended for children ages 4 and up. For younger children, we included buildable castles that include only large pieces to prevent a choking hazard, pre-built castles that feature strong elements of story creation, and castle toys that focus more on playing with the castle rather than building the castle. Another aspect of safety we were concerned with are the chances of a castle toy pinching a child. To combat this issue, we carefully combed through parent reviews for sturdy castle toys with minimal hinges and other mechanics that could injure a child. Overall, we not only want children to be safe and have fun, but also we want parents to feel confident when giving their children toys to play with. 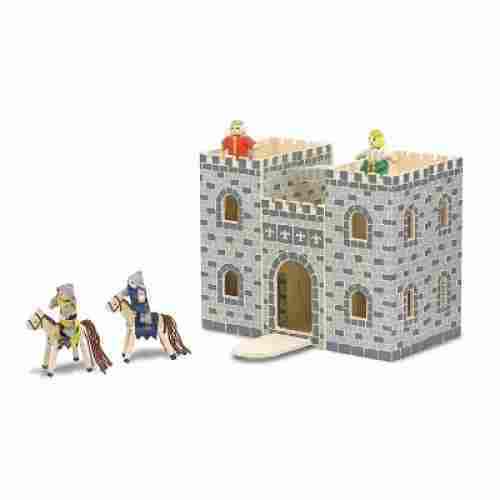 Many castle toys also feature bright colors and abundant moving objects which can entice your child into play. Focusing on these types of interactive play elements can demonstrate object permanence as well as introduce the concept of cause-and-effect relationships. Tracking the movement of lowering drawbridges and spinning turrets is an ideal way to build visual acuity. q: What are castle toys? 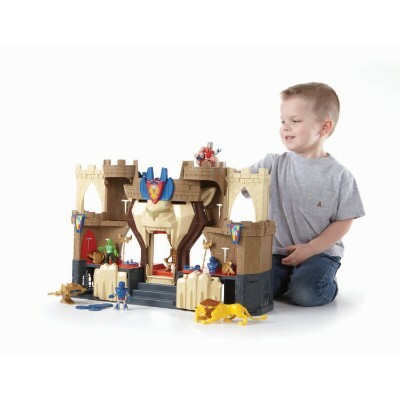 Most castle toys engage the imagination of children by having them build or create castles and other structures. Other castle toys simply look like castles so your child can focus on playing certain characters as opposed to building the castle. Typically, castle toys have both aspects of building and role-play for a fully developmental experience, but they can also be strictly one or the other. Some children like both aspects equally, but others would rather build the castle or play with the castle. q: Are there different castle toys for boys and girls? Yes, different castles toys are marketed toward boys or girls. Typically, brands like LEGO market toward boys because boys gravitate towards building and construction toys. 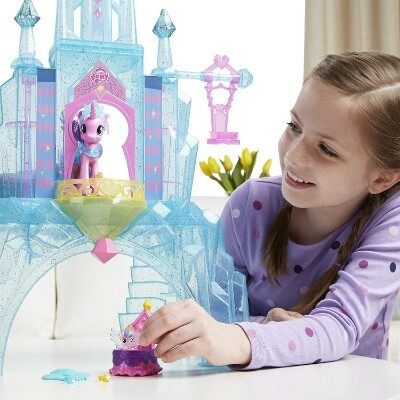 Brands like Barbie or Disney market toward girls with princess themes because girls typically enjoy playing with a castle as opposed to building it. However, if you notice your son wants to play with the castle, or that your daughter wants to build the castle, both are also normal. q: How do castle toys benefit my child socially? 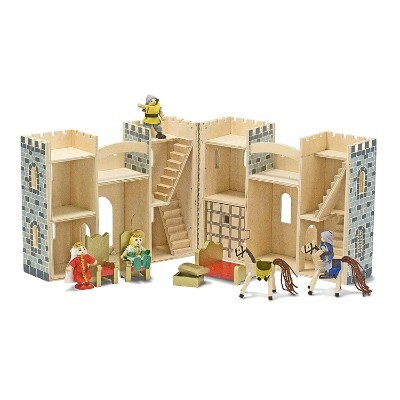 Castle toys promote cooperative playtime through both building and role-playing. Children can build the castle together and put forth a good team effort to complete the tasks. Role-play wise, children can take on certain characters, such as Anna or Elsa from Frozen, and re-enact scenes from the movie together. 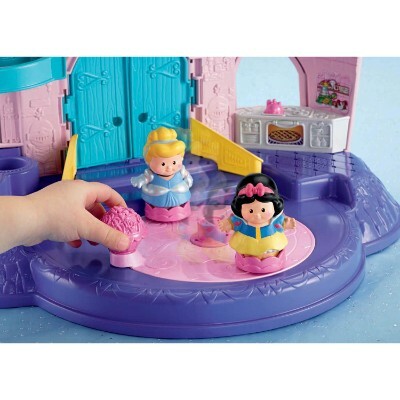 Castle toys can also help socially awkward children because the castle is a familiar setting that they know, creating a jumping off point for conversations with other children during playtime. q: Will a castle toy benefit my child’s psychomotor skills? If a castle toy has moving features, such as a hand-powered elevator or a catapult, then yes. Psychomotor skills refer to the brain processing movement in tandem with mental activity. So even the building of the castle itself can aid in psychomotor development. q: Do castle toys improve overall cognitive skills? By providing social, motor, psychomotor, and hand-eye coordination skills, castle toys do improve a child’s overall cognitive abilities. Because all these aspects work in tandem with one another, your child will not only develop their brain but have fun doing so in a natural fashion. q: What are some other benefits of castle toys? In addition to overall cognitive improvement, castle toys also exercise a child’s creative skills. By building the castle toy, your child also has the opportunity to create something new and unique to themselves. 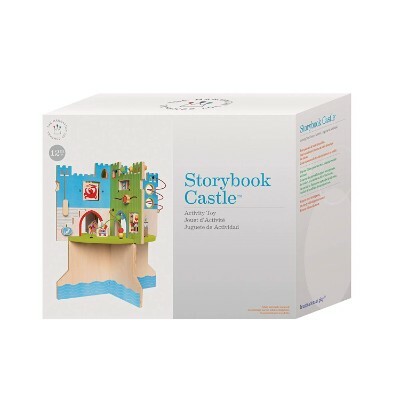 By role-playing with the castle toy, the child also has the ability to create storylines and characters within the castle narrative. q: Do castle toys promote problem-solving skills? Yes, castle toys absolutely promote problem-solving skills as well as other important skills. Because castle toys require kids to piece together different parts, children learn how multiple structures can come together and function as a whole. This can translate into mathematical concepts and scientific concepts later on in school. And, because castle toys have multiple pieces and multifunctional parts, children can also exercise creativity by creating new structures with the existing pieces. This really helps their problem-solving skills because they learn new and inventive ways to create what they see in their minds as real, tangible structures during playtime. q: What are the safety issues with castle toys? The main safety issue with castle toys are the small pieces involved in the actual construction of the toy. 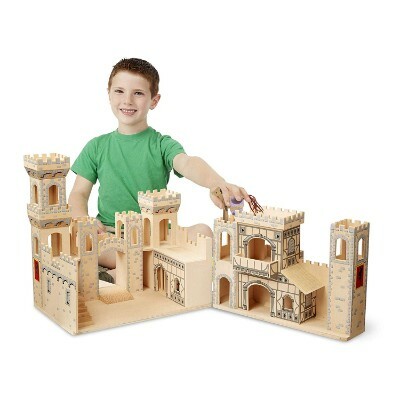 Most castle toys are beneficial because children can build and modify the castles. But, to smaller children, this poses an inherent choking hazard. So, when purchasing a castle toy, always look at the recommended age range to ensure you are buying an appropriate toy. Some castle toys are designed for small children and make use of over-sized pieces to prevent choking dangers. If you aren’t sure about a toy’s recommended age range, go to the brand’s website and check under the toy’s description. If you still can’t find the recommended age range, it’s probably best that you don’t but that particular castle toy. q: Is there a recommended age for castle toys? And at what age should my child stop playing with castle toys? Different castle toys have different recommend ages. This is simply because different toy brands cater to different types of customer needs. However, most castle toys range from 3 to 10 years in age. This is because many castle toys have small parts that children younger than 3 could choke on. The cap of 10 is mainly because children older than 10 lose interest or cannot gain much from castle toys. If the castle toys are not interfering with your child’s overall development, then they should be allowed to play with them to their heart’s content. But, if your child develops an unhealthy attachment to their castle toys, then an intervention might be required. q: If my child isn’t interested in castle toys, should I try to encourage them toward castle toys? Honestly, no. You can softly push your child toward certain toys, but ultimately, they decide what is and is not fun for them. There are dozens of other toys that give your child the same social, cognitive, and developmental benefits as castle toys, so they aren’t missing out on much by not taking an interest. However, if your child is reluctant about other kinds of social play, a castle toy is a great way to introduce them to more social interactions. In that case, you might encourage your child to play with castle toys.